Vehicle Crashes – What really happened? Many times the cause and results of an accident may seem apparent. Car A hit Car B and the driver of Car B claims that he is injured. But how fast was Car A moving? Was Car B moving? How is driver B’s injury usually caused? Did the driver of Car B have a pre-existing injury? How hard must a car be hit before the driver can usually suffer an injury? Was either driver using his available restraint system? 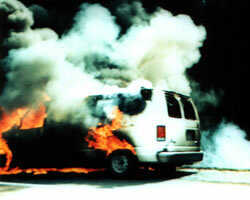 A fire starts in the interior of an automobile. Why did it start at the ash tray? Was it the cell phone, radar detector, or something else plugged into the lighter? Or was it trash in the ash tray? A boat catches on fire when the captain starts the engine after refueling. Was there a fuel leak? Was there another fuel source onboard? What was the ignition source for the fire? What really happened? The answer is rarely as it appears. With over 35 years experience in the automobile industry and 30+ years experience in litigation, Douglas J. Van Sweden, PE, Mechanical Engineer for 35+ years, can determine the answer. Find out what REALLY happened.